When Will Your Dental Implants in Mount Pleasant Need To Be Repaired? Unfortunately, there aren’t many purchases in life that last forever. That vehicle you just bought will eventually need to be replaced, the new roof on your house will get old, and even your dental work will need to be replaced at some point. At least, most of your dental work anyway! You’ll be glad to know that dental implants in Mount Pleasant are one exception that can potentially last a lifetime with the right care and maintenance. Although there are cases where repairs need to be made, you can learn how to prevent that as much as possible with a few tips and tricks. Keep reading to learn more! How Often Do Implants Need To Be Repaired? Implants are titanium posts that act as replacement roots for missing teeth. After the initial implant surgery has been done and they’ve fully bonded with the surrounding jaw bone, they’re restored with either a single dental crown, bridge or a denture. These restorations can wear out over time, just as regular dental crowns, bridges or dentures do after many years of use. But the implant itself can last many decades with good care. How Can You Help Your Implants Last as Long as Possible? Maintain good hygiene – Your implants can’t get cavities, but their success still depends on healthy gum tissue for support. Brush gently but thoroughly at least twice a day and floss at least once. Be sure to ask for a demonstration of proper flossing technique, as it’s different for implants. You might also benefit from an oral irrigator to flush out plaque and bacteria from the hard-to-reach places around an implant. Quit smoking – Smokers have a significantly lower chance of long-term implant success (85%) compared to non-smokers (95%). Get regular checkups – It’s important to see a dentist in Mount Pleasant every 6 months so they can monitor the health of your implant and treat any potential problems as early as possible. Wear a nightguard if necessary – Clenching and grinding put a huge amount of force on both natural teeth and implants. Over time, this may cause the implant to become less stable. Fortunately, a custom-made nightguard can prevent these issues. Also, if you notice any issues with your implant (such as tender, bleeding gums or a sensation that the implant is loose), schedule an appointment right away. Many times these problems can be treated before they lead to implant failure! Dr. Robert Sikes is a general and restorative dentist in Mount Pleasant with over 3 decades of experience. In addition to providing outstanding implant placement from start to finish, he also educates his patients about how to take care of their implants so they last as long as possible. If you have any additional questions, he can be reached via his website or at (903) 572-9720. 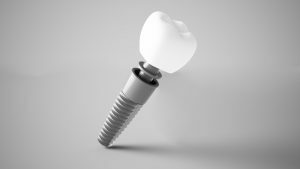 Comments Off on When Will Your Dental Implants in Mount Pleasant Need To Be Repaired?